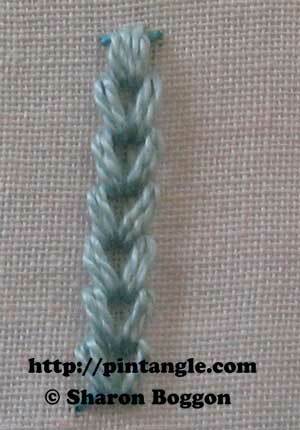 Portuguese Border Stitch forms a highly textured braid like stitch, which is a heap of fun to work. 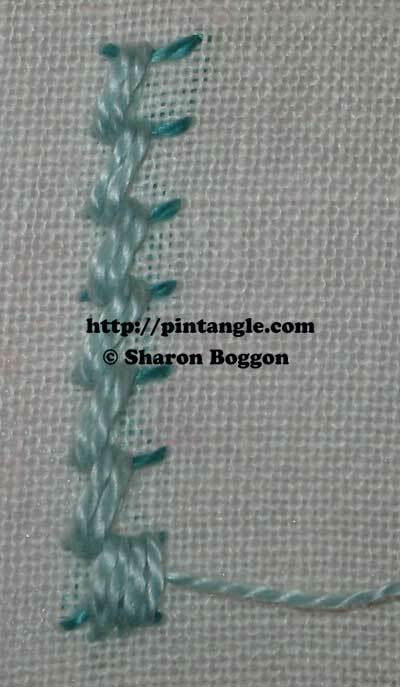 With this stitch you can also change threads when you work the top layer. The stitch forms good ridge and is ideal to use for strong lines or stacked side by side to produce a textured area.You can work Portuguese Border Stitch on the curve by changing the angle of the foundation stitches and I like the spacing created up the centre of the stitch as it is easy to place a bead in the middle to add a little extra zest. My sample was worked in perle 5 for the foundation stitches and perle 3 for the whipping stitches. 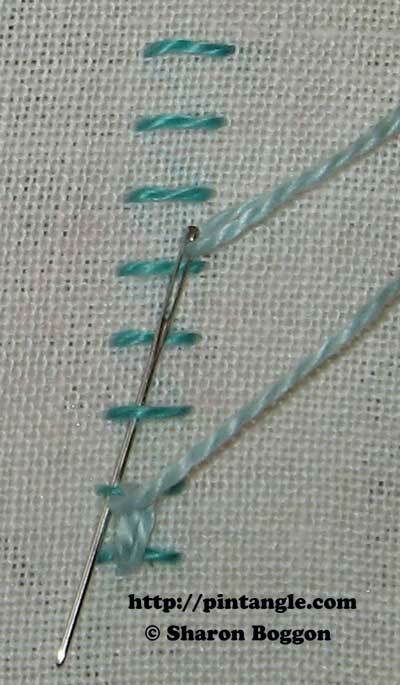 The stitch is worked from bottom to top. Note the needle does not pierce the fabric you are whipping the foundation stitches. Use a tapestry need for the second part of the stitch. This way you will avoid accidentally splitting the foundation threads. Work a foundation of a row of straight stitches. Don’t work them too tight as these stitches will be laced with a second thread. Bring the thread out at the bottom left of the first rung. Take the needle over the second rung and pointing the needle to the left take it under that rung. 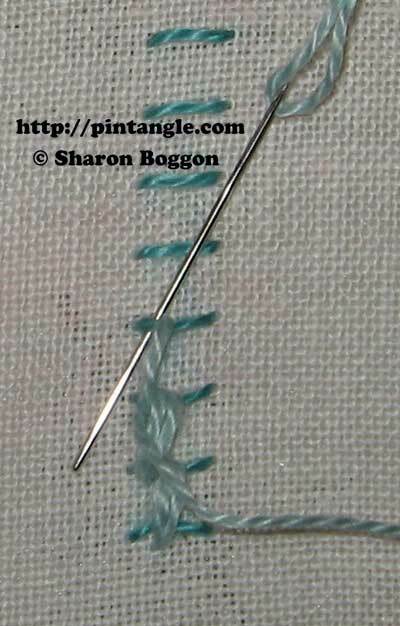 Pull the needle through so that the thread will loop around and under the first and second rung. On the second stitch take the needle over the second rung and pointing the needle to the left take it under that rung. You now have two stitches laced over the first and second rung. Take the needle over and thread it under the third rung keeping the needle pointing to the left. Take the needle over the third rung and pointing the needle to the left take it under that rung. Take the needle over and thread it under the fourth rung keeping the needle pointing to the left. Pull the needle through and a thread will loop over the third and fourth rung. Repeat up the ladder of foundation stitches. The pattern is over two rungs, over one rung, and move up the ladder. Or think of it as whip two (to start), whip one and up one. With Portuguese Border Stitch tension is important. Keep the whipping loose enough that the foundation stitches do not distort. Bring the needle out at the bottom again to commence the right side of the band. 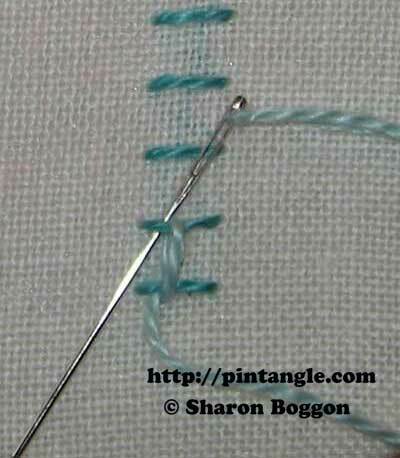 Work a second row of whipping, by repeating the process only angle your needle to the right as you work. I hope you enjoy Portuguese Border Stitch! I will use this on my stitch book cover..Thank you Sharon!! Must try harder! Strangely I find working on already patterned fabric very offputting. Here is my wotk for this week. I am a bit late, but a had few time to stitch this week. I like this stitch and I’m sure to use it frequently in the future. Thank you , Sharon and thanks to all for sharing their great examples! Hi Sharon & Friends, my post. Thank you all! Only one space open in my hexagon ball of stitches. I’ll have to go back to my first 2012 cloth and search for space there … or start something new! I couldn’t resist starting yet another project just to make good use of this stitch. A simple take on the Portuguese Border stitch. Easy and fun! I made a braided wreath because the season is near. Here is my portuguese border stitch sample. I put some woven centered samples on my Flickr site. Thank you again, Sharon for this chance to learn and create. Here’s an update on the sample with some additions. Here I have shown my work for this week’s challenge. This looks like a fun and interesting stitch. It’s another new one to me. Thanks! I had fun with week 46.